30 April 2010, at 10:04p.m. 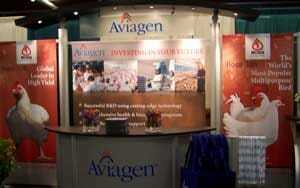 CANADA - Aviagen, Inc. recently participated in the 53rd Annual Poultry Industry Conference & Exhibition (PICE) that took place in London, Ontario, at the Western Fair Entertainment Centre on 14 to 15 April 2010. With thousands of poultry farmers, industry partners and suppliers in attendance at the show, the Aviagen exhibit was busy with customers and industry professionals discussing the latest Ross 308 and Ross 708 product information with company representatives. Dr Scott Gillingham, Canadian Regional Business Manager, Aviagen, Inc., commented: "Aviagen is dedicated to the Canadian poultry industry and supporting this important annual event is a key component of that commitment." In addition to the exhibition, Aviagen also hosted a breakfast presentation given by Dr Derek Emmerson, vice president of Research and Development at Aviagen, focused on key elements of the company's Pedigree breeding programme. The presentation attracted 47 participants and highlighted Aviagen's strategies to deliver balanced genetic improvement of broiler efficiency, general fitness and breeder performance and their approach develop products that are adapted to the needs of the global industry. Aviagen also hosted a customer appreciation dinner on Wednesday night at Amichi's restaurant. The Poultry Industry Conference and Exhibition two-day show is a blend of trade show and professional development featuring networking opportunities, a wide array of products & services, guest presentations and informative seminars. With 57,000 square feet of exhibit space and more than 160 booths to visit, the Poultry Industry Conference & Exhibition is recognized as a must-do event for anyone associated with this important agri-business.